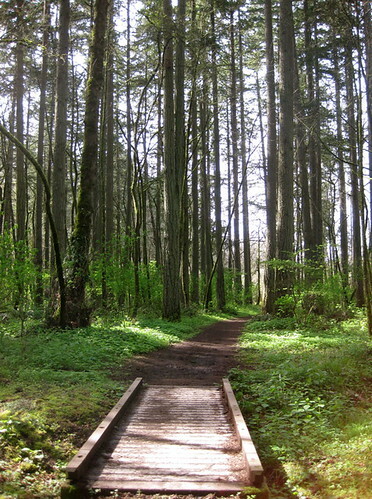 Last week I wrote about the City of Eugene’s Transportation Enhancement projects “Westmoreland Park Path & Lighting” and “Jessen Path & Lighting.” Another local project that deserves attention and input is Willamalane Park & Recreation District’s $1.6 million “Middle Fork Willamette River Path Phase 2” project. Currently Willamalane is finishing up phase 1 of this project, which is a 2.4 mile paved path from Clearwater Park to Quarry Creek. The path is complete and finishing touches of landscaping, fencing, kiosk construction and other amenity additions should be done soon for an estimated opening in April. The bridge over Quarry Creek is also complete, though the path ends there. The turn-around area at the creek will have a kiosk, picnic tables, and restrooms. More information on Phase 2 and a link to the ODOT survey after the jump. Phase 2 is broken into two sections. The first, 2a, will bring the path, from it’s current terminus at the bridge, around the Quarry Butte to the edge of the Dorris Ranch Living History Farm, a total of .63 miles. Rebecca Gershow, the lead Planner on the project for Willamalane, says that it is one of the more complicated sections of the full 4 mile path, requiring several sections of retaining walls as well as work that requires special attention to environmentally sensitive areas. 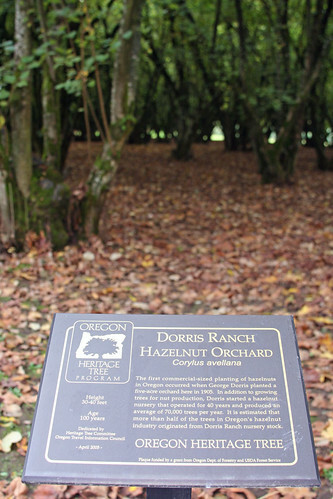 Once the path reaches Dorris Ranch, it will meet an existing path system of old farming roads and other soft surfaced paths that lead to the main entrance at South 2nd St. This existing path system will be enhanced and improved with general Willamalane funds. Phase 2b of the project is to take a different routing for the path on the east side of the wooded area. This new route will avoid the working filbert farm which can sometimes close the existing paths when harvesting or other farm work is required to be done. Once funding is acquired for phase 2a, Willamalane will begin searching for funding for 2b to complete the project. They are hopeful for a 2013 completion to avoid costly delays and renegotiating temporary construction easements with private property owners. Besides opening up a previously hidden stretch of the Willamette River, this new path will provide a nice connection to our regions river path system and will give an almost car-free way to get from North Eugene (near the Owosso Bridge) to Southeast Springfield. As Willamalane says in their information about the project, it will also “set the stage for future regional connections” across the river to Mt Pisgah and along the future Millrace path. Along with the viaduct being constructed as part of the I-5 Willamette River Bridge project and the proposed path along the river through Glenwood, it’s great to see Springfield moving ahead with these types of projects. As our regional multi-use path system continues to grow it not only provides us with wonderful recreational opportunities, it also connects more neighborhoods, parks and schools; connects more people with our great natural northwest environment; and connects us with our neighbors. Please take the time to give your input on this project (and the two Eugene projects covered last week) on ODOT’s Survey Monkey Survey: http://www.surveymonkey.com/s/TE_Public_Comments_Survey_2010. There is $16 million in available funding and $107 million in project proposals. Deadline is this Friday (Jan. 28th). Weigh in and let them know why these projects are important to our community! If you’d like to see all the applications for the TE funding check out this ftp site.